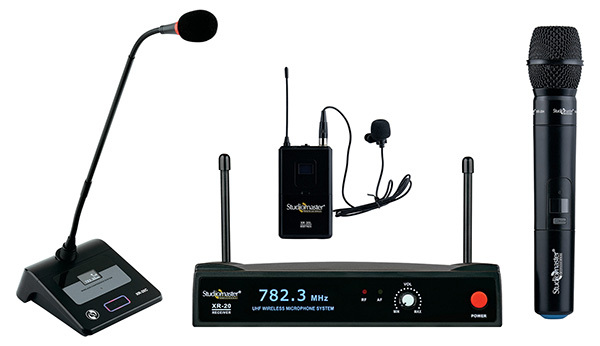 Studiomaster Professional is pleased to announce the availability of the XR 20 wireless microphone system. Inspired by the immensely popular and well received XR series, the XR 20 is a compact, lightweight, powerful, vigorously propelled, high-performance professional UHF wireless microphone system. With a focus on versatility, the XR 20 comes in three variants – the XR 20C (conference), the XR 20H (handheld) and the XR 20L (lapel). All microphones in the XR series boasts of a superior vocal reproduction and have a tailored frequency response of 50Hz -16Khz to optimize performance and reduce feedback. The built in LCD displays operating frequency of the connected transmitters. Over the years, wireless microphone systems from the house of Studiomaster Professional have been well received by the Indian market owing to the brands impeccable track record in the segment. With plug-n-play approach and stable performance the XR 20 is sure to find its place in restaurants, clubs, educational institutions & is the perfect choice for PA applications, stage and auditoriums, training rooms, seminar halls, places of worship and recreational centres. For more details you can visit your nearest local authorized Studiomaster Professional dealer.